Queen’s Beast coins from the Royal Mint of England are available annually in both gold and silver for sale. The silver coins include six options in total with two bullion coins and four collectible proof coins. The only coin available across both collections is the 10 oz silver coin. Right now, 2019 10 oz Proof Silver British Queen’s Beast Yale of Beaufort Coins are available to purchase online at Silver.com. Ships to you with a protective capsule, mint box, and Certificate of Authenticity! Sixth coin to feature in the Proof Silver Queen’s Beast Series! Mintage limited to 200 coins only! Bears a face value of £10 (GBP) backed by the government of Britain. On the obverse side is the portrait of Queen Elizabeth II. The reverse face features the image of the Yale of Beaufort. 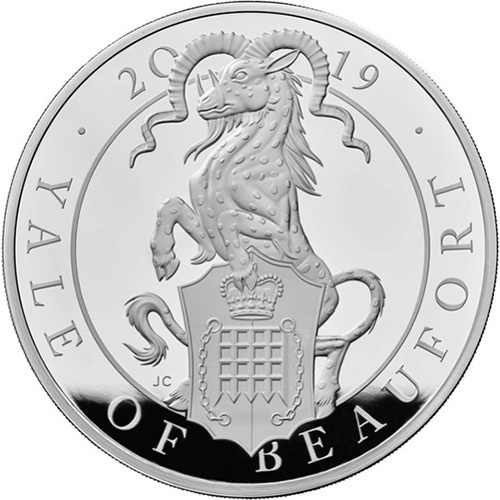 Each 2019 10 oz Proof Silver British Queen’s Beast Yale of Beaufort Coin is available to you inside of a protective plastic capsule. 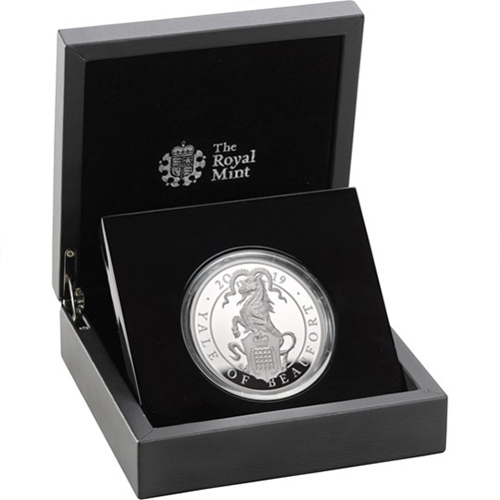 The encapsulated coins are housed inside of a commemorative Royal Mint display box and comes with a numbered Certificate of Authenticity courtesy of the mint. Silver Queen’s Beast coins are available in 2 oz and 10 oz silver in the bullion range. The Proof Silver Queen’s Beast coins are offered as 1 oz, 5 oz, 10 oz, and 1 Kilo coins. 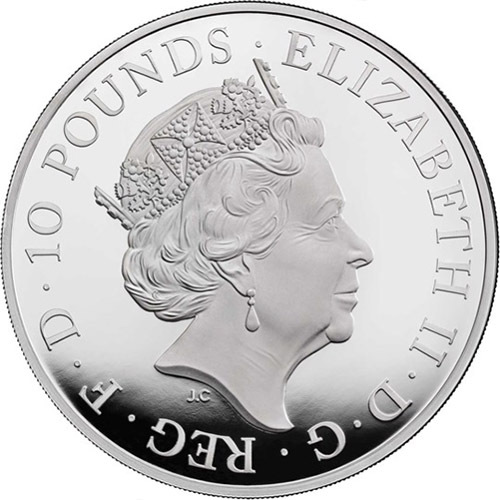 This makes the 10 oz coin the only weight in the series range available as both a bullion and proof option. The proof coins are differentiated by frosted design elements and mirrored backgrounds. On the obverse side of 2019 10 oz Proof Silver British Queen’s Beast Yale of Beaufort Coins is the image of Queen Elizabeth II. Her Majesty is Britain’s longest-reigning monarch and is featured here in right-profile relief. This is the fifth-generation design of the Queen to feature on British coinage and was created in 2015 by Jody Clark. The reverse face of 2019 Proof Silver British Queen’s Beast Yale of Beaufort Coins includes the image of Lady Margaret Beaufort’s seal. The Yale is a mythical beast that was commonly portrayed in European mythology as an antelope or goat. The beast has the tusks of a boar and the horns of a goat that often have wild twists and even face separate directions at times. Lady Margaret was the lone heir of John Beaufort, Duke of Somerset. Her seal came to the British Royal Arms through her son from her second marriage to Edmund Tudor. That son was King Henry VII, founder of the House of Tudor. If you have any questions, please feel free to reach out to Silver.com. You can call us at 888-989-7223, chat with us live online, or email us directly. Don’t forget to track changes in silver’s price using our silver price charts.